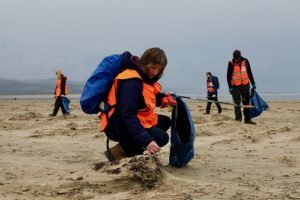 The Snowdonia Society carries out regular conservation volunteer days to help enhance and maintain the natural beauty of Snowdonia National Park. Our volunteers enjoy a regular programme of conservation tasks which take place come rain or shine, throughout the year. 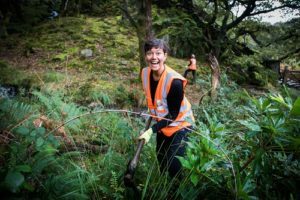 Whether you enjoy energetic activities such as clearing Rhododendron ponticum and maintaining Snowdon’s well-worn footpaths or prefer to hone/improve your identification skills by carrying out wildlife surveys or learning the characteristics of different habitats, our project has something for you. You can volunteer as an individual or with a group, every workday, once a month or just once a year. Snowdonia is your national park – come and help to ensure its survival in these changing times… If you don’t who will? We have a small number of spare coats, waterproof trousers, wellies and steel toe cap boots. If you would like to borrow some please let us know before a workday. Sturdy footwear (such as hiking boots or wellies with steel toecaps) is essential. Trainers or other light shoes are not acceptable. if you are aged 16-17 you will need to have a parental consent form signed before you can volunteer alone.